Recently the soundtrack from “The Greatest Showman” has been the only music playing in my house. In fact, as soon as we left the movie theater over Christmas Break, one of my kiddos pulled up the album on Spotify and “Project Learn All the Songs” commenced. I have a tendency to completely immerse myself in an album if I am drawn in and love the music. Sometimes my family grows weary of hearing the same songs over and over and over again, but that’s how the music seeps down into the marrow of my bones. I turn the lyrics over slowly and repetitively on my tongue like a piece of ice on a hot summer day. The music melts in and becomes a part of me. Most of our memories are wrapped up in some kind of sensory marker. If we see a picture, smell certain food, or go to a certain place, we can uncannily retrieve a memory attached to the sense engaged. Music is the marker of my life and my life is full of musical Ebenezers (1 Samuel 7:12). I remember the music from times of triumph and times of defeat. I remember the music from times of joy and times of sadness. I remember the music from times of love and times of heartbreak. Just hearing certain music sets off a chain reaction of emotional memory and usually awakens a beautifully satisfying spiritual pilgrimage to past experiences. How true is this?! I want to feast on the commands of God designed to bring me fullness of life and fullness of joy. Knowing how I’m wired means 2018 is a year I am planning to immerse myself in songs that speak of God’s principles. And this spiritual discipline isn’t only for musicians. It’s biblical baby. I have heard this said many times and experienced it in my own life many times. My explanation of this is there is no other explanation. Last summer we were babysitting two of our small great-grandsons. We have a swimming pool in our backyard and Ty (two years old) loved swimming with all of us, but always wore his life jacket. This particular day my husband and son were on the patio putting together a barbeque pit, and Ty was sitting in his little chair watching them. My daughter-in-law and I were inside with his younger brother. I knew Ty was in good hands. My husband is always overly cautious when it comes to kids and the pool so there was no reason for me to be concerned. All of a sudden, I had a sudden urge to ask about Ty’s whereabouts. “Can you see Ty?” I asked my daughter-in-law. She immediately jumped up and ran out the back door and saw he wasn’t sitting in his chair! “Where is Ty?” she screamed while running toward the pool. We were all hugging him, crying, and thanking God for His mercy and perfect timing. I am so thankful for a loving God who speaks to us even when we are unaware of our need. We all have a story and your story matters. Your story tells the history of your journey with Christ and speaks to the beauty of humanity. We engage in sharing our stories because our stories connect us. As the New Year begins, we want to be women who embrace new beginnings. We serve a God of second chances, and what better opportunity than the New Year to encourage one another to risk hoping for a new beginning! “I called to the LORD in my distress, and He answered me.” (Jonah 2:2). When was the last time you felt the Holy Spirit nudging you a particular direction and your first instinct was to flee? If whatever the task before me requires battling insecurities, my flesh begs me to forgo the fight and just flee. A few years ago I was asked to serve in a capacity I had only dreamed about in my home church. Almost as quickly as the excitement built at the thought of using my gifts and talents in this area, an equal amount of apprehension overwhelmed my spirit. I reflected on my previous track record with similar tasks. Isn’t that how we evaluate potentially new tasks, through considering and analyzing what we have been able to accomplish in the past? Despite reciting scriptures encouraging me to trust God’s promise to enable and empower me to complete the task ahead, I stalled and filibustered when pressed to confirm. I was hesitating to step into leadership though I knew God was calling me to that specific purpose. As God would have it, the next few weeks’ worth of sermons covered the book of Jonah. Though I was familiar with his story, Jonah’s experiences with second chances washed over me in a fresh and powerful way. Jonah flat out refused to obey God’s command to preach to the Ninevites. God could have used another prophet to preach His message of coming judgment, but He loved Jonah enough to punish him, leading Jonah to repentance. Our God gives second chances. He delights in our steps toward the right direction. Furthermore, when He calls us to a task, He will empower us. Philippians 2:13 says, “For it is God who is working in you, enabling you both to desire and to work out His good purpose.” This verse speaks truth in the face of apprehension. Not only does God work in me to accomplish the task, He also enables me to desire to complete it. So if God is calling you to a specific role, task, or purpose, and you are hesitating to obey, know God delights in your steps toward His calling. Know He will birth the desire to complete it, and above all, He will work it through you for His good purpose and glory. This morning I laid out the 4+ years of Dad’s Dinks I still have in my possession. My intent was to pick a few of my favorites and text them to him throughout the day. But as I began reading through them, so many memories flooded my soul and I was overwhelmed with the treasure I have. The enemy is after our children and my Dad knew the value of going to battle for his kids. Exodus 15:3 says, “The Lord is a warrior; Yahweh is His name.” My Dad has been many things to me, including coach, running buddy, youth minister, and boss. However, it is no wonder that sense my Dad is created in God’s image, the warrior is core to his identity and his role. The Bible even talks about children as arrows in their parents quiver (Psalm 127:4-5). Warrior image. 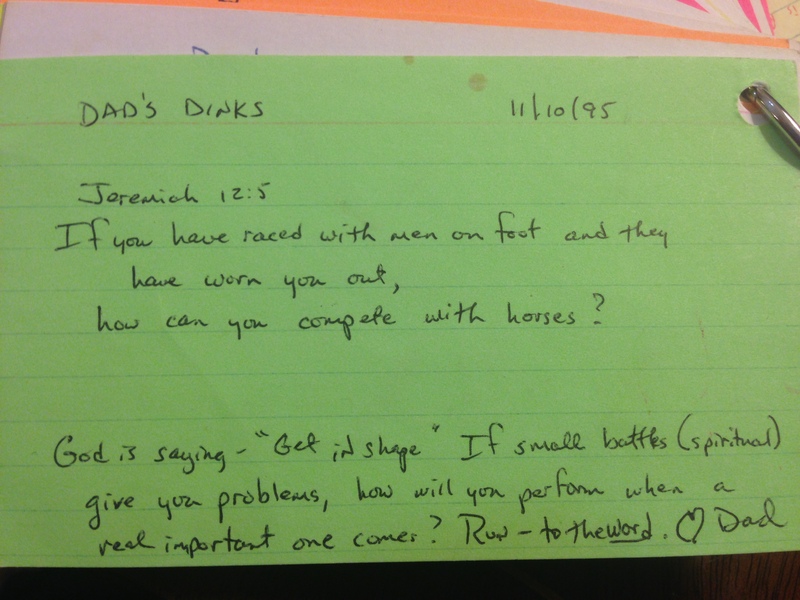 My Dad started these “Dinks” when I was playing volleyball in junior high, and they continued through college. Many mornings, I would wake up with an index card lying on my dresser. The “Dink” always contained a scripture verse, and usually a thought or two. Miraculously, I held on to them, not fully appreciating their value at the time. I could write a sappy post about how loving my Dad was through these cards (which he was! ), but more importantly I want to highlight how he was lovingly teaching me how to fight the enemy. As a parent, I appreciate the discipline it took for him to pen these truths to me. The words shared between a daddy and daughter can never be underestimated. Yes, my Dad taught me to play basketball, to ride a bike, to drive, to waterski, etc. But more importantly, he taught me to fight with the Word. 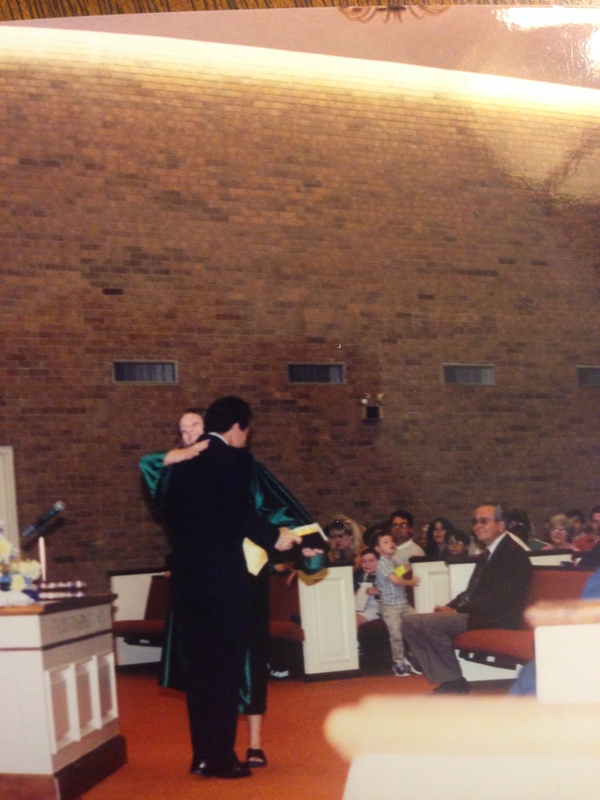 My Dad knew the weighty responsibility he had to impart a spiritual legacy to his children. I have great respect for him and for the godly example he set. So to all the dads out there: the little things matter. 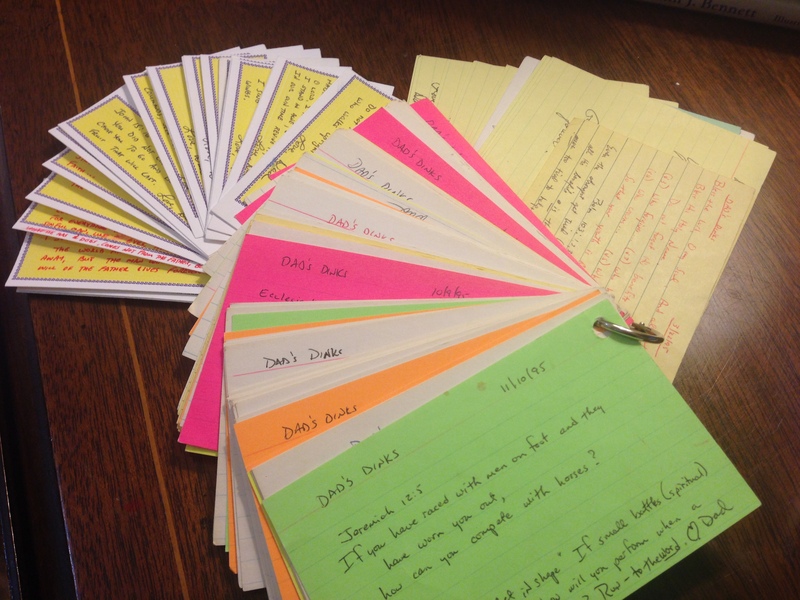 They add up to big piles of index cards forever cherished. Happy Father’s Day Daddy. The Mother’s Day Problem. Where do I want to be this Mother’s Day? Celebrating with my momma, of course! Where do my children want to be? Celebrating with me (I hope)! And therein lies the dilemma. 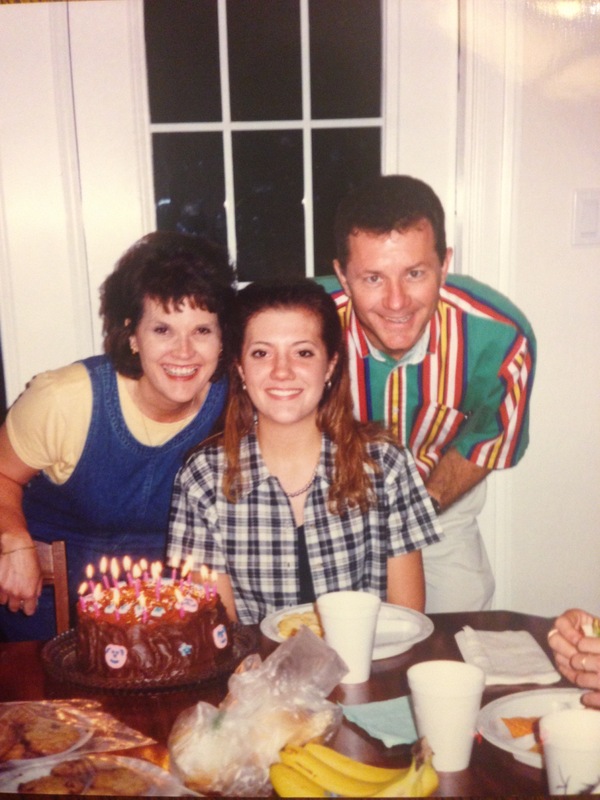 On this side of adolescence, I find myself blessed immeasurably to have grown up in a minister’s family. I am able to answer God’s call for full-time ministry with experiential, first-hand ministry knowledge. I am familiar with a handful of the dilemmas unique to full-time ministry. Sunday holidays can be difficult. I remember as a kid listening to my parents wisely determining the best use of my Dad’s Sundays off. Maybe your church provides you with more Sundays off than you know what to do with, but most of us ration our free Sundays for family and for our own spiritual edification, a time when we can be fed and replenished. Naturally, requesting a Sunday off for Mother’s Day isn’t usually a priority. So what are my options? The kids and I could travel to my parents’ home and celebrate, but leaving my husband behind on this holiday just doesn’t sit right. My Mom could come to me, but then she would be coming solo…because as previously mentioned my Dad is a minister. Again, leaving the guy behind who has seen you through the ups and downs of motherhood seems anti-climactic. What about you? Maybe your Mom and Dad can travel to you, or maybe due to extenuating circumstances or location, that isn’t a possibility either. I could sit in a puddle of tears and self-pity. I could resent my husband’s job or the calling. And truth be told, I have unfortunately chosen the path of self-abasement on occasion because I was stricken with homesickness. However, without fail God gently speaks to me, the Spirit awakens His calling, and I am forced to decide whom I will serve. God or myself. Will I think about and set my mind on things eternal (Colossians 3:2) or will I worship my own desires (Philippians 3:19). Perspective is everything. Will I celebrate with my mother during our next visit? You bet. I have a heightened thankfulness for the culture God has allowed me to live in. I do not have to wait for the snow to melt before I can hitch up the horses to a cart and travel hundreds of miles to see my mother. Hello FaceTime! I cannot allow my sadness to catapult me into tunnel vision, lead me to self-pity, and loose the kingdom perspective. So as we approach another Sunday holiday, if you are a minister’s wife and find yourself wishing things were different, just know I am praying for both of us. I pray we will live and work out of the Spirit inside of us and not our flesh (Romans 8:5). I pray God will use these sometimes lonely holidays to grow our love for His people and open our eyes to those around us hurting. I pray Satan is not given the opportunity to sow resentment and bitterness in our hearts. You can be certain there are many other women wearing the same ministerial shoes and walking the same path. 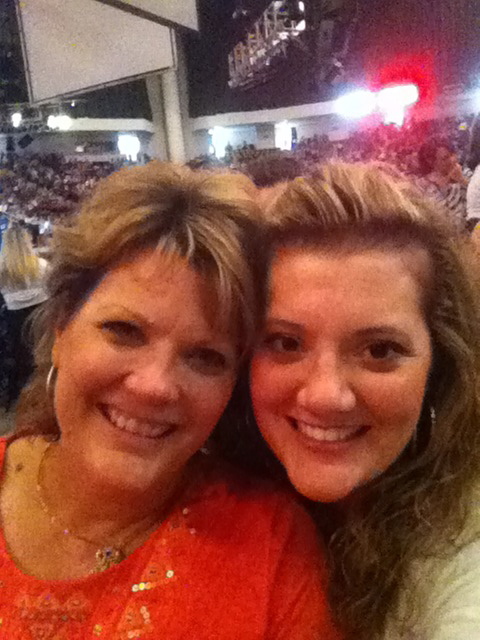 May we all tune our hearts and minds to Christ…and love our mommas.